Looks like the bulldozers will be gone from Austi Beach before Christmas- as promised. 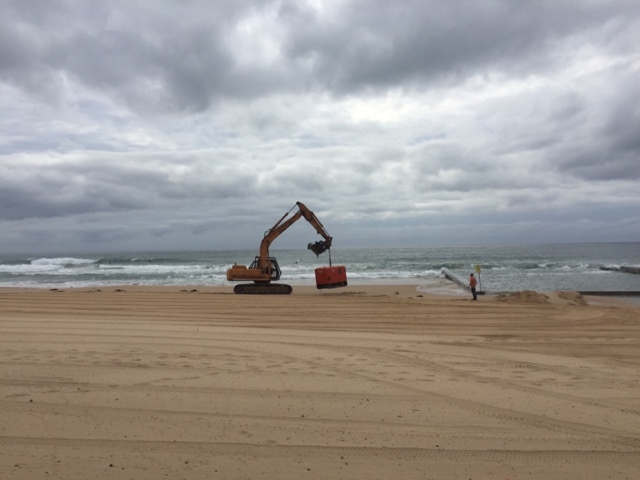 For 19 months, earthmoving equipment has been trundelling across the sand and clogging up the car park as work continued in the Ocean Pools. Then a fortnight ago, work began to replace the playground, taking another chunk of the popular tourist precinct out of action. Wollongong Council says it’s all coming to an end. Work on the northern pool is now complete and while there are still things to be done in the Southern pool, that won’t start until after the summer holidays. It’s also hoped the playground will be replaced and turf laid where the old playground was before the end of this week. It’s hoped the current rain won’t delay completion of that work. It appeared this morning that bulldozers were cleaning the northern end of the beach, perhaps ahead of their departure, freeing up numerous parking spaces at the northern end.